Home / fashion news / Fashion gone truly maritime? by thefashionnomadon 12, September, 2011 12, September, 2011 Leave a Comment on Fashion gone truly maritime? One of the best things about any fashion week is the fantastical nature of fashion and all the cool photos that come out of it. 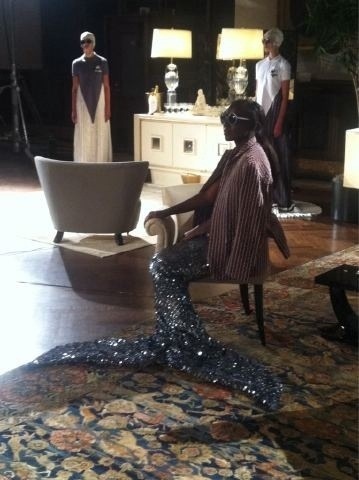 Case in point this mermaid dress by Thom Browne from his showcase at New York fashion week today. The image is from Barneys New York’s fashion Director, Amanda Brooks. Doesn’t it take the maritime theme to the extreme? It’s so far fetched it’s brilliant again. Anna Dello Russo would approve, I think. Roll on New York Fashion Week, roll on. You’re providing so much amusement and things to comment on. Previous ArticleIt’s Fashion Week time!!! !